No need to pack an umbrella, Valencia has 300 sunny days per year and the advantage of being both a city and a beach destination. It has conquered my heart in a speed of light with its terracotta colors, panorama of cupolas and mouthwatering tapas. If that's not reason enough to book yourself a flight ticket right now, perhaps these one of a kind specialty coffee shops will do the trick. But be warned, you might end up not wanting to leave! It's not always easy to start out and be the new girl in town. Thanks to these two barista darlings at Retrogusto Coffeemates I felt at home in Valencia from the first sip. Martina and Paula are as cafecionado as they come and their story is one of determination and dedication. As their take away coffee shop is located in Valencia's bustling and picturesque Mercado Central, it is easy to combine sightseeing with your coffee cravings. You'll be served no less than excellent roasts by Barcelona's finest: Nomad Coffee and Right Side Coffee Roasters. So how have Martina and Paula found their way to specialty coffee in Valencia? As many stories nowadays in Spain, it started with the financial crisis. In 2012 their work place was affected by job cuts, which forced them to change and reinvent. They turned the negatives into positives with the decision to brave the economic downturn in their country and start a business of their own. It had to be about quality coffee, as it was something both were extremely passionate about and was lacking in Valencia. In the following years they met with and learned from influencers of Spain's specialty coffee scene, such as Miguel Lamora - two time winner of national Latte Art Championships and founder of Atmans Coffee in Barcelona. When practicing at home was not enough anymore, the eagerness to know more brought Martina and Paula all the way to the London Coffee Festival, where they tried all the coffee they could find. After years of preparation, the first beans were finally hitting the grinder in May 2015. At Retrogusto Coffeemates my taste buds travelled from Kenya and Ethiopia all the way to El Salvador in less than two weeks. While Right Side Coffe Roasters are a regular in the first grinder, the girls have recently acquired a second grinder for guest roasters and have worked with Nomad from Barcelona, Five Elephant from Berlin and Hola Coffee from Madrid In an attempt to enchant locals and visitors with new and exciting flavours, beans are rotated frequently. Martina and Paula believe that every moment has its coffee, which is why their menu is your oyster. It holds all the favourites, whether you prefer milk based or pour-over. And when those hot Valencian summer days have you longing for something refreshing, cold drip and iced coffee tonic will cool you down. "Bluebell, pretty bluebell....you will always be the flower of my heart.". This song by Scott Walker is what inspired Marián to give her coffee shop the name Bluebell Coffee Co. Together with her sister Yolanda and her sisters partner Erwan, she opened the first specialty coffee shop in Valencia in September 2014. It is located in the bohemian Ruzafa neighbourhood, where Valencians love to shop vintage and go for drinks in funky bars. Before Marián started her business, she lived in the US where she completely immersed into the local coffee culture. A small café in Montana, where she was a regular, gave her the last push and motivation to open something of her own. Upon returning to Europe, she went coffee hopping in Berlin and collected ideas for her project. Bluebell used to work with Barcelona based Nomad Coffee and Right Side Coffee Roasters as well as Puchero Coffee Roasters with beans rotating ever 2-3 weeks. They have recently started roasting their own beans though in a warehouse outside the city. They've established relationships with a coffee farm in the Dominican Republic that uses innovative techniques to give their coffee beans a honey flavour. Espresso based drinks, V60, Aeropress and cold drip are all a safe bet! Bluebell is a looker and a must for foodies! A stunning blue La Marzocco, gorgeous courtyard and flowery, positive atmosphere are unique features of the coffee shop in Ruzafa and the weekend brunch is a real treat! While the years 2016 and most of 2017 saw no new specialty cafés opening up in Valencia, I was excited to see that in 2018 the drought had finally ended. In April this year Blackbird landed on one of Ruzafa’s bustling streets a stone’s throw away from the local market, bringing to the neigbourhood delicious home made treats paired with great coffee. The mother-daughter duo running this sweet venture has lived in Venezuela, England and Australia before moving to Valencia two years ago. Romina’s superpower is baking incredible cinnamon buns, cakes and doughnuts, while her mother Maribel is the master of savory toasts and sandwiches. When living in Australia and working as a barista, cook and pastry chef Romina first got to know about specialty coffee. Soon the idea to open her own café someday was born. “We wanted to bring the two worlds together and serve both quality coffee and pastries.”, she says. Through a giant window you can watch Romina and Maribel put their hearts into the preparation of each and every recipe. Of course the coffee to be served in their own shop had to be specialty, which is why they work with roasters such as Nomad and Tornado. For now a Moccamaster is left in charge of the filter brews. The future might hold a proper brew bar and a second take-away café in the center of Valencia. Gema and Rafa opened up the specialty coffee shop Los Picos in vibrant Ruzafa late 2017. They fell in love with specialty coffee already back in 2012 when trying it for the first time at Toma Café in Madrid. Their love story continued, both with coffee and ‘Twin Peaks’, apparently. When I asked whether the two of them loved hiking to find out what inspired the name of the cafe, Gema laughed: “I am definitely a city girl. The name was inspired by the TV series!”. The multi-roaster cafe is changing beans on a weekly basis. 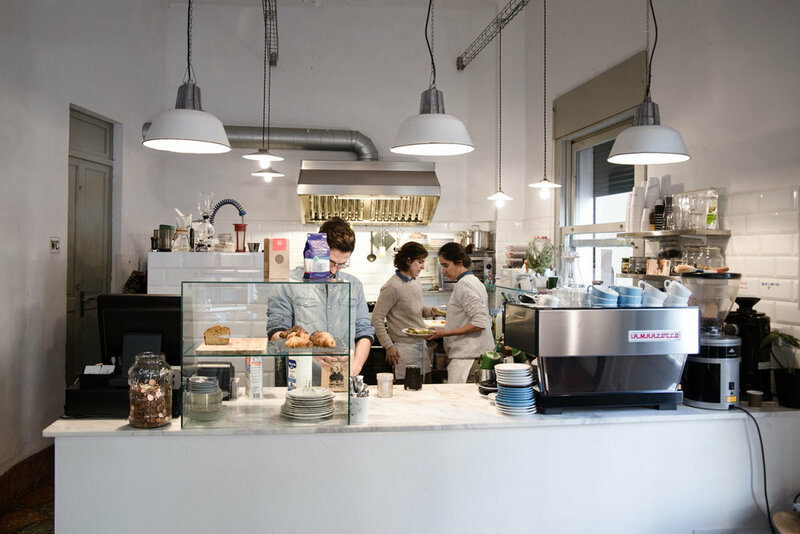 From SlowMov, Right Side Coffee Roastery, San Augustín and Puchero Coffee Roasters to Valencia based Don Gallo you’ll find some of the best coffee Spain has to offer. But at Los Picos Spain is not the limit, Berlin based The Barn and Tres Cabezas have also been featured before. Gema and Rafa organise cupping sessions to help spread the word about specialty coffee, hoping that more people will start to taste the difference between quality and commercially grade coffee. Trust that you’ll be in good hands here, whether you’re already a pro or just starting to learn about coffee. The customer experience at Los Picos is excellent and everyone goes out of their way to make you feel welcome. Your culinary well-being is taken care of as well - you’ll find a small selection of cakes and other sweet treats straight from Blackbird’s kitchen.